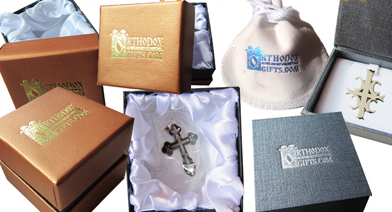 FREE 2DAY Shipping on all 14k White Gold & Yellow Gold St. Olga Style Crosses- no coupon code needed. Choose "Free Shipping" at Checkout and we will send your cross via 2Day Delivery- US street addresses only. (Other items in your order may ship separately.) Order submission cut-off time for same business day shipping is 2pm EST. When choosing a cross, it helps to take out a ruler to see the size that you are ordering. When buying crosses for infants and children, keep in mind that they grow quickly and will soon outgrow the baby crosses that many people choose for baptisms. When choosing the perfect chain, you need to determine where it will lie on your chest. Our 16-inch chains, known as choker length, fall just above the collarbone on adults, emphasizing the neckline. Our 18- and 20-inch chains, the most common lengths for adults, hang over the collarbone. Our 22- and 24-inch chains, which create a more dramatic look, are usually worn over a blouse or dress. To find the cross or chain you need, click on your preferred metal type below. What's the difference between 14 Karat Gold and 10 Karat Gold? What size chain should I get? Pure gold is naturally yellow and no matter what combination of white metals are used in the alloy to bleach it (nickel, palladium, silver, manganese, or zinc) the result is never as intense as naturally white metals. Rhodium has a reflective silvery sheen that brightens white gold items, taking them from dull ‘wellow’ to wow. It’s a silver saver: Rhodium plating is the most effective way to protect sterling silver from tarnish caused by oxidation. Rhodium is a noble metal of the platinum family and highly resistant to corrosion. Unless it gets rubbed off, it will keep silver shining and eliminate the need for frequent polishing. Other than antiqued, nickel plated, or gold plated silver items, virtually all of our silver branded and specialty collections are rhodium plated. It’s there for flair: Luminous white, rhodium makes diamond-cut finishes dazzle like nobody’s business. It is also used on yellow or rose gold items to provide detail and give the appearance of two-tone and tri-color designs. Rhodium is good for you and your jewelry: Rhodium is hypoallergenic which is great news for people who are sensitive to nickel—a common component of gold alloys and often in sterling silver too. Plating prevents irritation which is why some people even opt to have their yellow gold items plated. Rhodium is also scratch resistant and can protect high-polished items under normal wear. It’s easy to care for: Clean rhodium plated jewelry with a few drops of mild liquid dish detergent diluted in a cup of water. Wipe gently with a soft cloth or sponge and promptly dry with a lint-free cloth. Do not soak or leave to air dry. Like all jewelry, store pieces in a manner that prevents them from rubbing against other items that may scratch or tarnish them. Under normal wear, rhodium should last for years and many items may never need replating.